Biography – Ben Abarbanel-Wolff | Saxophonist and composer. Tenor and baritone saxophonist Ben Abarbanel-Wolff (b. 1974) grew up in Washington, D.C. He began piano lessons at the age of five, and switched to saxophone at age ten. 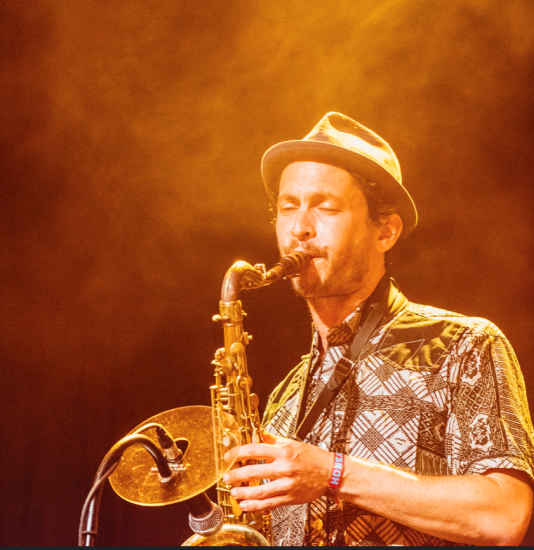 Ben studied saxophone at the University of Michigan, the New School for Social Research, and Bennington College, where he earned his Master’s degree. Ben has studied with: Reggie Workman, Roscoe Mitchell, Charles Gayle, Donald Sinta, Matthew Shipp, Roswell Rudd, Rob Brown, Gary Louie and Charlie Persip. At Bennington College, Ben studied intensively with master drummer and healer Milford Graves. In 2001, Ben moved to Berlin, Germany, where he has been active in the city’s jazz, funk, and west african music scenes. He has been seen and heard in diverse musical styles, performing and recording with: Xavier Naidoo, Ulrich Gumpert, Sirone, Poets of Rhythm, Marva Whitney, Gwen McCrae, Pat Thomas, Patrice, Megaloh, Ebo Taylor and most recently Max Herre and Guts, among many others. He is a founding member, musical director and producer of the Afrobeat Academy, who recorded and toured with the legendary Ghanaian guitarist and composer Ebo Taylor from 2009 to 2015. Ben produced Ebo’s 2010 album Love and Death, which is considered a classic of its genre. In 2014 Ben teamed up with the Ghanaian multi-instrumentalist Kwame Yeboah to create the Kwashibu Area Band, dedicated to the preservation and innovation of Highlife music. Their production “Pat Thomas & Kwashibu Area Band” was released on Strut Records in 2015. The band performed at over 100 international festivals in 2016 and 2017, including Glastonbury, Roskilde, Hertme, Fusion, Sines, Montreal Jazz Festival and WOMADelaide. Their follow-up album “OBIAA!” will be released on Strut Records in 2019. Ben can also be seen performing with the German hiphop star Megaloh. In 2019 he will be touring with the French producer Guts as well as with Pat Thomas & Kwashibu Area Band. Gwen McCrae, Marva Whitney, Tony Allen, Kurtis Blow, Ebo Taylor, Max Herre, Patrice, Jan Roder, Maze, Daryl Taylor, Kalle Kalima, Joyce Sims, Torch, Antonis Anissegos, Xavier Naidoo, Melba Moore, Megaloh, Henrik Schwarz, Philip Sindy, Henry Taylor, Frank Schellenberger, D Flame, Nosliw, Oghene Kologbo, Robbee Mariano, Ann Sexton, Michael Griener, Guts, Toni L, Max Weissenfeldt, Ekow Alabi Savage, Jimi Tenor, Sirone, Maria Raducanu, Maurice de Martin, Tony Buck, Alan Mensah, Musa, Chima, Osei Tutu, Christian Weidner, Michael Beckmann, Neil Palmer, Derek Shirley, Michael Thieke, Henrik Wahlsdorf, Andrew McGuiness, Sebastian Duwelt, Eric Owusu, Kwame Yeboah, Stu Krause, Eric Schaefer, Oliver Steidele, Mircea Tiberian, Ralf Gustke, Alex Auer, Ade Bantu, Don Abi, Maurice de Martin, Jan Weissenfeldt, Pat Appleton, Thomas Myland, Giuseppi Coppola, Zdenko Curulija, Franck Biyong, Oleg Rovner, Uli Bartell, Germ, Sammy Quist, Patrick Frankowski, Akinola Famson, Pal One, John Schroeder, Christian Weber, Danny Fresh, Dede, Addo-Nettey a.k.a. Pax Nicholas, Ono, Tone, Soehne Mannheims, Ulrich Gumpert…too many to mention all–hopefully many more to come!